Ho'oponopono for the Doctor's Soul: The Gifts of Being "Deaf"
The Gifts of Being "Deaf"
Mabel Katz read a story on her Ho'oponopono phone call a couple of nights ago -- and I was surprised to hear my name as she was speaking. It seems I had sent the tale to her nearly a year ago, and forgot having done so. Once upon a time there was a bunch of tiny frogs who arranged a climbing competition. The goal was to reach the top of a very high tower. A big crowd had gathered around the tower to see the race and cheer on the contestants. The race began. Honestly, no one in the crowd really believed that the tiny frogs would reach the top of the tower. "Oh, WAY too difficult!" "They will NEVER make it to the top." Or: "Not a chance that they will succeed. The tower is too high!" The tiny frogs began collapsing -- one by one except for those who in a fresh tempo, were climbing higher and higher. The crowd continued to yell, "It's too difficult! No one will make it!" More tiny frogs got tired and gave up. But ONE continued higher and higher and higher. That one wouldn't give up. At the end everyone else had given up climbing the tower. Except for the one tiny frog who -- after a big effort -- was the only one who reached the top! Then all of the other tiny frogs naturally wanted to know how this one frog managed to do it? 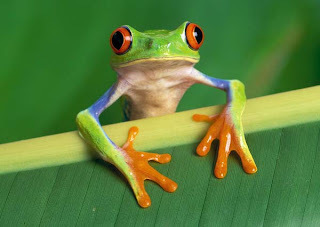 A contestant asked the tiny frog how he had found the strength to succeed and reach the goal? It turned out . . .
. . . that the winner was DEAF. The wisdom of this story is: Never listen to other people's tendencies to be negative or pessimistic because they take your most wonderful dreams and wishes away from you -- the ones you have in your heart. Always think of the power words have. Because everything you hear and read will affect your actions. In Ho'oponopono, one's focus is always on being with God rather than whatever else seems to be going on. This includes being surrounded by people who say such a practice is nuts, loopy, or unrealistic. We simply clean with every [possibly "problematic"] situation and person that presents in our lives, no matter what. Our purpose on the planet is to do exactly this, moment by moment by moment. In so doing, we can erase the toxic memories interrupting clear perceptions . . . and arrive at a point of Zero, as our Creator made us. Mana and inspiration can then come, showing us what to do next. But the cleaning always comes first. For the ancient Hawaiians (and for people currently practicing Ho'oponopono) the idea of an etheric plane was/is very real. These etheric and energetic forms come before the physical; Morrnah Simeona spoke of "thought forms" that could eventually objectify on the physical plane. Ho'oponopono cleaning of toxic memories takes place within us, where most of us cannot "see" immediate results. But some can. Dr. Ihaleakala Hew Len is one of these, despite those who doubt it's possible. The more ordinary of us may at least feel something happening in our hearts. The little frog who made it to the top of the tower simply kept moving ahead, focused on his task. His seeming "handicap" -- not being able to hear the naysayers -- turned out to be a very great gift. For any who might want to hear Mabel present in person, she's headed to Morristown, New Jersey in a few days. After that, you can see her in Italy! Also, the Foundation of I has started up its 2009 schedule of basic trainings. I can't prove it, don't know how it works, and often can't see the results until looking back. But I feel something peaceful in my heart with Ho'oponopono. Maybe it's my connection with Love, or God. So like the little tree frog, I keep on keeping on. Thanks, Mabel, for the reminder. Thanks for your great Ho'oponopono blog post. - I really love your blog. Thank you for your comments and your beautiful Blog.We all need to be reminded, because it is so easy to go back to our old habits, specialy when we "hear" and pay attention outside of ourselves. There is nothing like being DEAF and follow your heart. It never fails! Thank you for your TRUST. I love to have you in my classes.